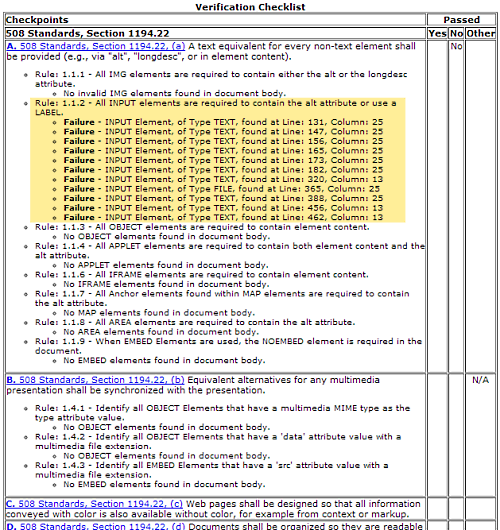 For years an item that has been overlooked by many US web developers is "508 Compliance". US Federal law requires certain classes of websites to meet Section 508 standards. Failing to do so can place a site at risk of litigation. The 508 Standards are intended to help provide equal web access to all individuals. The current 508 standards mostly apply to the vision-impaired. All Federal websites are required to meet Section 508 guidelines. Similarly, any site selling products and/or services are at risk of litigation if the site does not meet 508. Several years ago Target was famously sued by the National Federation for the Blind (NFB) under 508 Compliance rules. Target was forced to settle despite having a relatively good defense arguing that the numerous Target Stores across the US provided adequate physical access to products for the vision-impaired. Having a physical presence across much of the US didn't shield Target from having to comply online. Provide matching LABEL tags for INPUT tags. Provide ALT and/or LONGDESC attributes for IMG tags. Provide NOSCRIPT section when SCRIPT section is present. Should NOT rely solely on color to convey data/functionality. Should NOT rely solely on graphics to convey data/functionality. Should notify users when a timed response is required. The last item, "Should notify users when a timed response is required", applies in more cases than you might imagine. For websites that require a login, the standard "user session timeout" period is 20 minutes. That is, if there is no user activity (navigate to a new web page, submit a form, refresh a page, etc) a website will often automatically log the user out after 20 minutes. If a user is required to be logged in to fill out an online form and if sessions are set to expire after 20 minutes of inactivity, it could be argued that a website does not meet 508 compliance if there is no message referring to the fact that the user only has 20 minutes to complete and submit the form. Just because a website creator doesn't intend for a form to have a 20-minute limit doesn't mean that the form still isn't time-limited and in potential violation of 508 compliance rules (if no "time limit" message is provided). A number of resources exist for testing 508 compliance. You can use online services to test live sites or download programs and browser toolbars to test local sites still under development. Comprehensive site-wide testing is typically only available through paid programs and/or services, especially in cases of sites that have not yet been launched (not yet accessible through the web). However, you can use some online services to spot-check individual pages for free -- even for sites that are not publicly accessible. One of the oldest and most-used online services is Cynthia Says. This is often the standard tool used by auditors of Federally-funded websites. The online service is a "demo" of the functionality of the full (paid) software package. The free online service only checks one page at a time. A Cynthia Says report showing 508 compliance failures related to INPUT tags. If your site is already online simply browse to CynthiaSays.com, enter the URL to the page you wish to check and click the "Test Your Site" button. Within seconds you'll have a report (shown above) on 508 compliance for that page. Occasionally the CynthiaSays site gets very busy so you may have to submit more than once if the report doesn't come back within a few seconds. Some 508 compliance services allow you to upload the contents of a page if the page is not publicly accessible. The free Cynthia Says online service does not provide this option. You can still test local-only pages, however: simply browse to the page, use "View Source" to see the page's rendered code and save that code to a publicly-accessible file (such as "cynthiasays.htm"). Now you can use the CynthiaSays service to test the contents of the saved file as if the page were being publicly served. To test other pages simply replace the file's contents and have CynthiaSays re-scan the same file. The most convenient free 508 testing option is a browser toolbar. I am not a big fan of adding toolbars to my web browsers but, if you're not adverse to potentially slowing down your browser, a number of toolbars are available. If you're unsure whether a toolbar is seriously impacting browser performance check out the toolbar performance testing tool from TFT. The best single list of accessibility validation tools is maintained over at the www.w3.org website within their Web Accessibility Initiative subsite. As of this writing the W3 list includes links to 119 English-language tools.